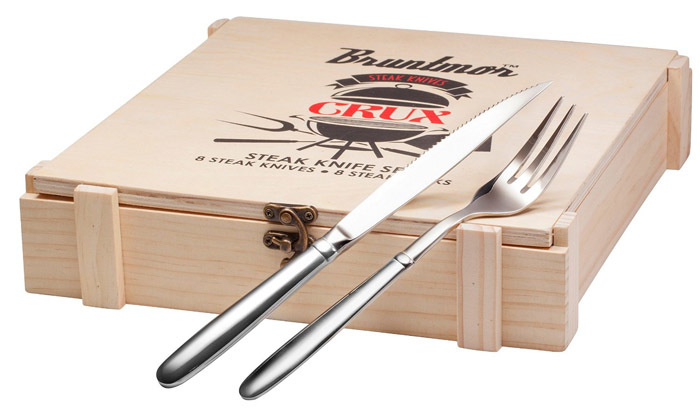 It’s BBQ season around our house and that usually means steak and the best steak deserves the best cutlery. This collection of steak knives from Bruntmor really caught my eye. 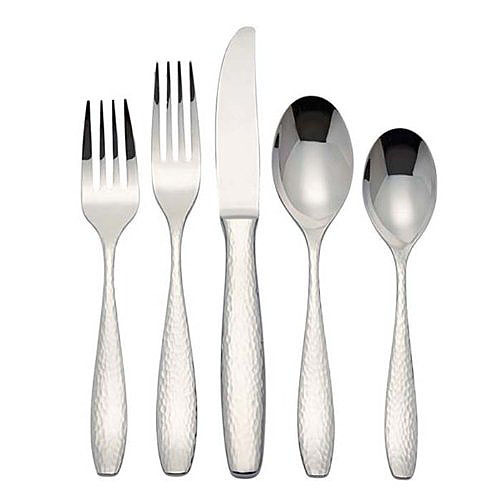 This 16 piece set of three pronged forks and serrated knives is made of dishwasher-safe 18/10 stainless steel. I really like the look of the hinged wooden cutlery box. A lot of thought went into the balance and weight of this flatware. Great for a gift or treat for yourself and it’s a great price. In first place by a huge margin is anything even remotely related to Nutella. It is such a popular topic on this blog that we even made a category for Nutella. 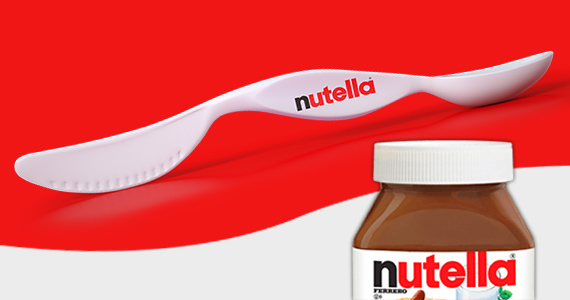 And the shown Nutella knife (or Spife) was the top of the charts. You people are crazy for Nutella. In second place is the Artaste Rain Stainless Steel Flatware which a lot of people really liked and the feedback after purchasing was quite good. 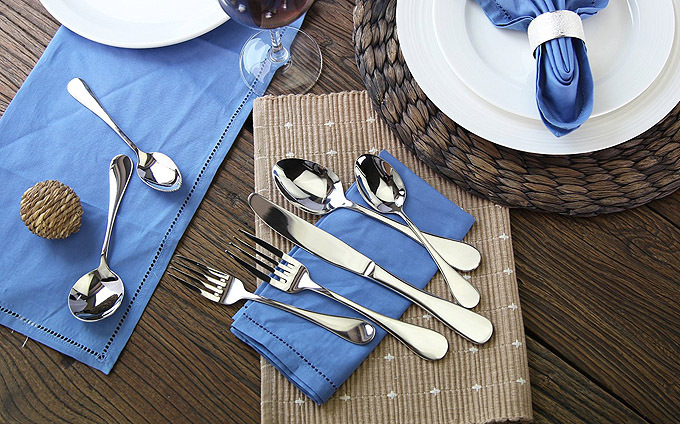 And I have to say this is one of the nicer and better staged photos for cutlery that we’ve seen in a long time. And in third place is not cutlery or flatware but a wonderful piece of artwork. 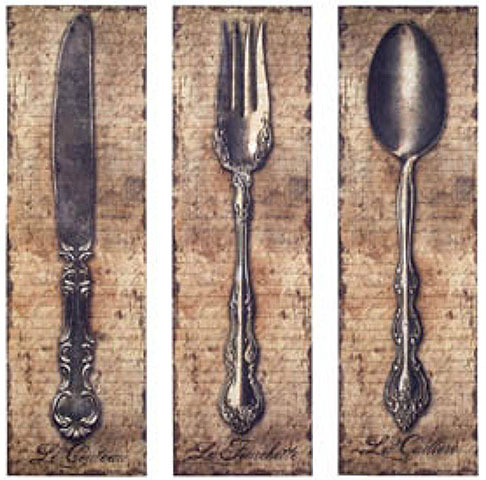 The Vintage Kitchen Silverware Canvas Wall Art of a Spoon, Knife & Fork was a post from 2014 that continues to be a very popular item in 2015. And an honorable mention goes out to two celebrity related cutlery items. 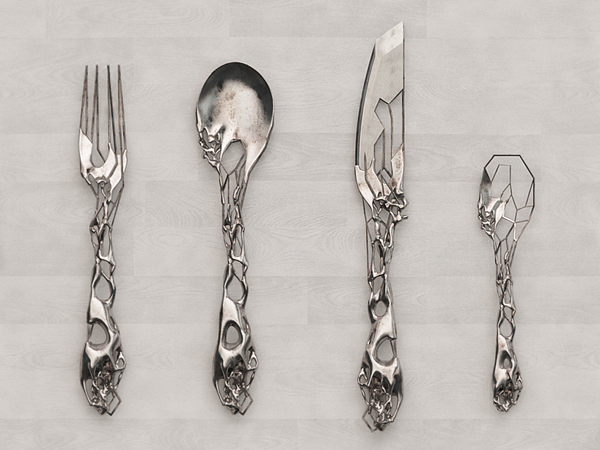 “This is not Silverware by Tim Burton. 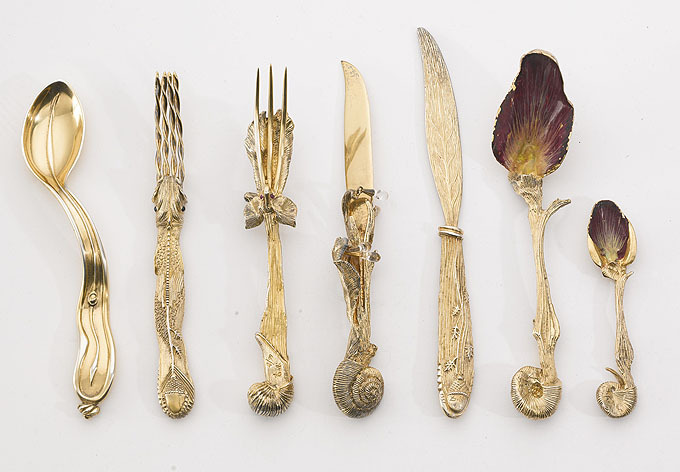 It’s by Isaïe Bloch.” and “Salvador Dali – Ménagère (Cutlery Set) 1957” both seemed to settle a lot of discussion about who made what and when and what it sold for. This is a great looking Christmas gift. 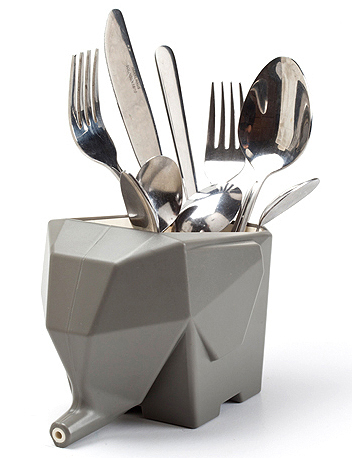 Peleg Design has this wonderful elephant cutlery drainer that is a treat for the eyes and very useful. It’s one of those things that when you see it you ask yourself “Why didn’t someone invent this before?”. Their description of it really says everything: “Sometimes, a runny nose can be a big plus. Jumbo the elephant will be more than happy to drain all excess water from your wet cutlery straight into the sink.”. Made of plastic and perfect for stuffing with all your dripping forks, knives and spoons. And it’s a multi-tasker as it could be used for toothbrushes in the children’s bathroom. I really like the hammered look on the handles of this flatware from Reed & Barton (and it hides scratches). The “Palmer 65-piece cutlery set” is setting for 12 with forks, knives, teaspoons, salad forks, and place spoons. It includes a full serving set with a tablespoon, cold meat fork, pierced tablespoon, butter knife, and a sugar spoon. It is made of 18/10 Stainless steel and is dishwasher safe with a 25-Year limited warranty. There has been some complaints about rust spotting, but that can be prevented, please refer back to our post Rust spots on Cutlery on how to avoid.